Hemoglobinopathies are disorders affecting the structure, function, or production of hemoglobin (Hb) and encompass all genetic diseases of Hb. They fall into two main groups: thalassemia syndromes and structural Hb variants (abnormal Hbs). α- and β-thalassemia are the main types of thalassemia; the main structural Hb variants are HbS, HbE, and HbC. Worldwide estimates show that each year, over 50,000 new patients are born with a severe form of thalassemia (beta-thalassemia major and HbE beta-thalassemia) and nearly 80% of these births occur in developing countries. Overall, the prevalence of beta-thalassemia carriers is estimated to be between 2.78 and 4% in India  which has a huge burden of an estimated 100,000 patients with thalassemia. Another Asian country, Pakistan, has a carrier rate of 5%–7% and nearly 5000–9000 children are born with β-thalassemia every year; similarly, in Bangladesh, 2500 thalassemia major cases are added every year. Complete screening is based on the detection of red cell indices, HbA2, HbF, and Hb variant by high-performance liquid chromatography (HPLC) or Hb electrophoresis. In particular, HbA2 determination plays a key role in screening programs for β-thalassemia. The other technique available includes mutation screen by obtaining fetal sample through chorionic villus sampling. Techniques for prenatal prevention include identification of pregnancies at risk, based on history and prospective screening of asymptomatic women by cordocentesis at 16–22 weeks' gestation followed by fetal blood analysis by HPLC. Although many medical centers in countries such as China, India, Lebanon, Pakistan, and Iran are running thalassemia prevention programs, there are no nationally coordinated programs for the same in most developing countries. In Australia, most of Northwest Europe, New Zealand, and North America, prenatal diagnosis is available and antenatal carrier screening is a standard practice. Organizations like the Asian Network for Thalassemia Control are also focusing on education, screening, and prenatal diagnosis in Asia. The Iran National Thalassemia Prevention Program, a combination of extended family and mandatory premarital screening, reduced the birth rate of a thalassemic child by 30% between 1997 and 2004. In Thailand, more than 85% of all pregnant women are screened annually. Countries such as Pakistan, Iran, Saudi Arabia, and Lebanon which initially practiced only premarital screening to disallow marriage where both partners were carriers have now reinterpreted religion to include prenatal diagnosis and abortion till a particular gestation. Cost of the treatment of thalassemia includes life-long blood transfusion support combined with chelation therapy. Patients need to undergo laboratory tests such as complete blood counts, iron studies, and tests for heart, kidney, and liver function. Referral to pediatricians, hematologists, and endocrinologists is also necessary which may entail additional costs such as hormonal studies for growth monitoring [Figure 1]. Very few patients have access to a permanent cure in the form of blood and marrow transplants due to nonavailability of human leukocyte antigen-matched donors coupled with lack of infrastructure and financial constraints plaguing the developing countries. A recent Indian study has shown that the treatment expenses of a patient with thalassemia ranged from US$ 629 (INR 41,514) to US$ 2300 (INR 151,800) annually at an average of US$ 1135 (INR 74,948). Nearly half of this was spent on medications. In Thai children, the annual average cost of treatment was US$950; 59% was direct medical cost, 17% direct nonmedical cost, and 24% indirect cost. Cost estimation for the management of single case of transfusion-dependent thalassemia in Thailand is 6 million Baht (US$149,899) for the patient to survive up to 30 years' old. Cost-benefit ratio is found to be 72:1 for screening versus treatment. Similarly in Iran, the total cost of treating thalassemia was €1,730.52 per patient annually and €26 million/year for all registered thalassemic patients. In Sri Lanka, it is estimated that 5% of the current health expenditure budget will be needed to treat 2000 patients at any point of time. In a country like India with a population of 1300 million, it is estimated that 10,000 new thalassemia cases are added every year, and at any given point of time, there are 100,000 people living with thalassemia. It is obvious that, if this continues unhindered, the treatment of thalassemia will be a huge financial burden, much more than what it is today. Current estimates of thalassemia treatment do not take into account various subsidies being given by blood centers and the government. We therefore realistically examined the cost of treatment incurred per year, at current rates without the subsidies, and estimated that average annual cost to be Rs. 167,750 per patient [Table 1]. This cost does not include transportation cost and loss of school days/working days. India with a population of 1300 million has a birth rate of 19/1000 population. This means that, at any given time, antenatal cases account for 1.9% of the total population, which implies that the number of children born every year is 24.7 million. Therefore, to avoid birth of 10,000 thalassemic children, every year we need to screen these 24.7 million pregnant women. Going by current market rates, it is possible to screen for Hb variants by HPLC/Hb electrophoresis to detect thalassemia early in pregnancy for about Rs. 500. If mass screening of all antenatal women (24.7 million) is implemented through centralized testing centers, then these rates will probably come down to Rs. 250 or even less. Hence, from [Table 2]-E, it is evident that cost of preventing the birth of these 10,000 patients every year by screening of antenatal women is Rs. 6175 million. In contrast, the cost of treating these 10,000 patients over an estimated life span of 40 years is Rs. 66,800 million [Table 2]-D]. Thus, the cost of prevention is only one-tenth of the treatment costs. The total treatment cost needs to be calculated for prevalence (100,000 patients) and not the incidence (10,000 patients) as all existing patients (old and new) need to be treated. To treat 100,000 patients per year, the total expenditure incurred, irrespective of who pays for it or who subsidizes it, amounts to Rs. 16,700 million at the rate of Rs. 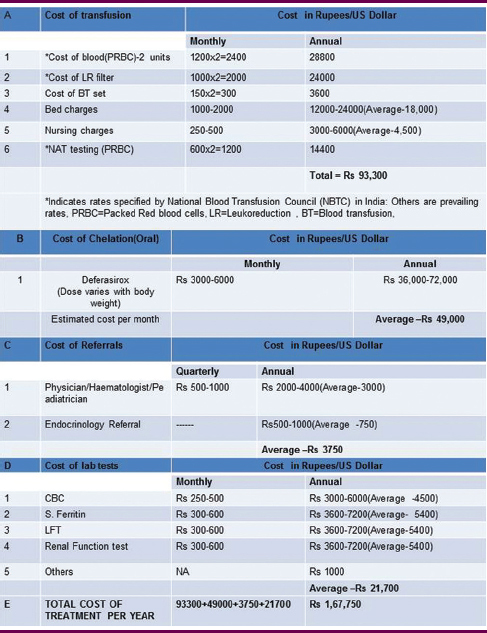 1, 67,000 per patient estimated in [Table 1]-E. This expenditure of Rs. 16,700 million will need to be continued year after year and will only increase as and when new patients are added or the costs go up. Thus, the total annual cost of treating 100,000 patients and preventing birth of 10,000 new cases is Rs. 22875 million (~381 million US $) [Table 2]-G]. India's GDP is Rs. 151,000,000 million financial year 2017–2018. Thus, the cost of treatment and prevention is only 0.015% of our GDP. Likewise, countries such as Pakistan, Bangladesh, Sri Lanka, and Nepal also have similar problems and need to proportionately increase spending on prevention programs. It is heartening to note that the Government of India has embarked on an ambitious health insurance program to cover 500 million population amounting to Rs 500,000 million. While this money may appear large, it amounts to only 0.3% of our GDP. As per reports, India spends just 1.3% of its GDP on health care. This figure is much lower compared to BRICS countries – Brazil spends around 8.3%, Russian Federation 7.1%, and South Africa around 8.8%. Among SAARC countries, Afghanistan spends 8.2%, Maldives 13.7%, and Nepal 5.8%. India, the fastest growing economy in the world, spends just 1.3% of its GDP on health care. To treat and prevent thalassemia, we need to increase this by just 0.015%. To cover not only thalassemia but also many other preventable diseases, we need to earmark at least 0.5% of our GDP for preventive health care. The need of the hour is a nationally coordinated thalassemia control program. This needs an expert committee for steering the program, setting up of centralized testing centers for Hb variant screening, and other laboratory tests besides setting up of blood transfusion centers. Screening for 1.9% of country's population is a massive workload and will therefore necessitate a well-coordinated courier network linked to centralized testing centers. This is not difficult considering the fact that there are many laboratories already having a countrywide network who will only be too happy to scale up their workload. Treating 100,000 patients spread across the country is a difficult job. Setting up blood transfusion centers across the country is not feasible. It is therefore proposed to make a 10 m 2 area mandatory in all medium and large hospital-based and nongovernmental organization-run blood centers exclusively for transfusion services. However, the cost of blood and transfusion must be reimbursed to these transfusion centers by the government by scaling up spending on health care. It would probably be good though a little more expensive to cover all thalassemic children under a comprehensive insurance program so that they are free to avail treatment at a center of their choice. In Israel, it is estimated that the cost of preventing one affected newborn was $63,660 compared to $1971,380 for treatment of a patient during 50 years (mean annual cost: $39,427). Thus, the prevention of 45 affected newborn over a 10 years' period represents a net saving of $88.5 million to the health budget. Each prevented case could pay the screening and prevention program for 4.6 years. Cao et al. from Turkey reported reduction of the birth rate of thalassemia major from 1:250 live births to 1:4,000 after execution of comprehensive genetic preventive program. Prevention programs for eradication of thalassemia have already been applied successfully in Cyprus, Italy (particularly Sardinia), and Greece. Another study from the United Arab Emirates has shown that as long as the carrier rate remains high, carrier-carrier marriages will continue and it will be difficult to curtail thalassemia major. While thalassemia can be controlled, it cannot be eradicated. However, countries in the Mediterranean belt and countries such as India, Pakistan, Iran, Turkey, Bangladesh, Sri Lanka, and many others have no alternative but to implement screening programs to bring down the prevalence of thalassemia carrier status. Global migration is another factor for increase in thalassemia cases in countries outside the thalassemia belt. This is one of the reasons why international agencies should come forward to help control thalassemia in the Mediterranean belt. It is evident that, in the long term, prevention is far cheaper than treatment. What the Asian countries need is a dedicated nationally co-ordinated thalassemia screening and treatment program. For this to be successful, we need an expert committee, increased funding on health care, and centralized testing centers with a good courier network. In addition to thalassemia, there are many other preventable diseases. 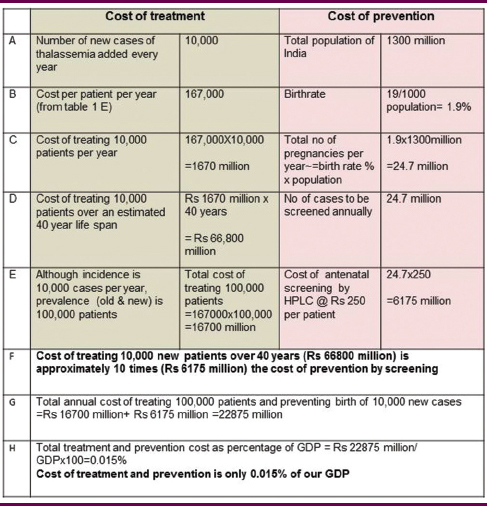 If thalassemia in India can be controlled by spending just 0.015% of GDP, then imagine the benefits of earmarking 0.5% of our GDP for preventive health care. The need of the hour is to increase spending on health care by all developing countries. Kohne E. Hemoglobinopathies: Clinical manifestations, diagnosis, and treatment. Dtsch Arztebl Int 2011;108:532-40. Colah R, Gorakshakar A, Nadkarni A. Global burden, distribution and prevention of β-thalassemias and hemoglobin E disorders. Expert Rev Hematol 2010;3:103-17. Ansari SH, Shamsi TS, Ashraf M, Farzana T, Bohray M, Perveen K, et al. Molecular epidemiology of β-thalassemia in Pakistan: Far reaching implications. Indian J Hum Genet 2012;18:193-7. Mandal PK, Maji SK, Dolai TK. Present scenario of hemoglobinopathies in West Bengal, India: An analysis of a large population. Int J Med Public Health 2014;4:496-9. Giambona A, Passarello C, Renda D, Maggio A. The significance of the hemoglobin A(2) value in screening for hemoglobinopathies. Clin Biochem 2009;42:1786-96. Baxi A, Manila K, Kadhi P, Heena B. Carrier screening for β thalassemia in pregnant Indian women: Experience at a single center in Madhya Pradesh. Indian J Hematol Blood Transfus 2013;29:71-4. Fucharoen S, Winichagoon P. Haemoglobinopathies in Southeast Asia. Indian J Med Res 2011;134:498-506. Available from: http://www.who.int/bulletin/volumes/86/6/06-036673/en/. [Last accessed on 2018 Mar 20]. Samavat A, Modell B. Iranian national thalassaemia screening programme. BMJ 2004;329:1134-7. Moirangthem A, Phadke SR. Socio-demographic profile and economic burden of treatment of transfusion dependent thalassemia. Indian J Pediatr 2018;85:102-7. Economic Burden of Beta-Thalassemia/Hb E and Beta-Thalassemia Major in Thai Children. Available from: https://www.researchgate.net/publication/41561358_Economic_burden_of_beta-thalassemiaHb_E_and_beta-thalassemia_major_in_Thai_children. [Last. [Last accessed on 2018 Mar 20]. Sattari M, Sheykhi D, Nikanfar A, Pourfeizi AH, Nazari M, Dolatkhah R. The financial and social impact of thalassemia and its treatment in Iran. Pharm Sci 2012;18:171-6. 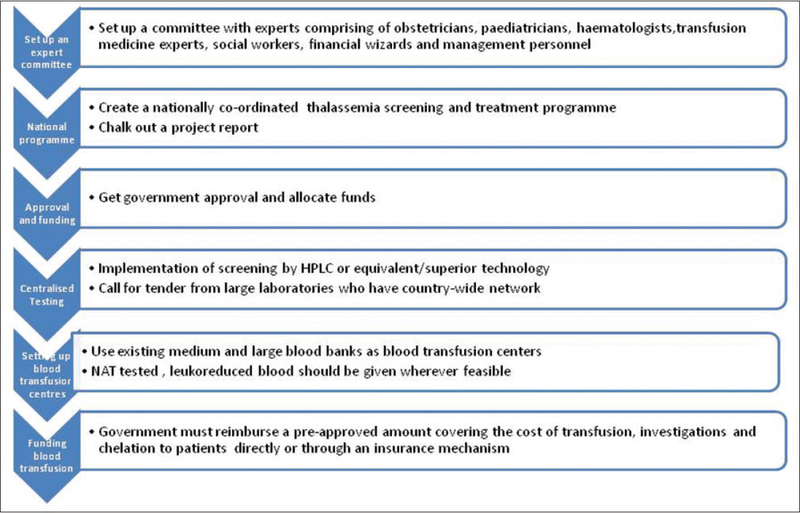 Thalassemia in Sri Lanka: A Progress Report. Available from: https://www.researchgate.net/publication/8354959_Thalassemia_in_Sri_Lanka_A_progress_report. [Last accessed on 2018 Mar 23]. Shah N, Mishra A, Chauhan D, Vora C, Shah NR. Study on effectiveness of transfusion program in thalassemia major patients receiving multiple blood transfusions at a transfusion centre in Western India. Asian J Transfus Sci 2010;4:94-8. Available from: https://www.indexmundi.com/india/demographics_profile.html. [Last accessed on 2018 Mar 20]. Available from: http://www.pib.nic.in/newsite/PrintRelease.aspx?relid=163287. [Last accessed on 2018 Mar 20]. Available from: https://www.economictimes.indiatimes.com/industry/healthcare/biotech/healthcare/india-spends-less-than-brics-saarc-nations-on-health/articleshow/56848698.cms. [Last accessed on 2018 Mar 20]. Koren A, Profeta L, Zalman L, Palmor H, Levin C, Zamir RB, et al. Prevention of β thalassemia in Northern Israel – A cost-benefit analysis. Mediterr J Hematol Infect Dis 2014;6:e2014012. Cao A, Rosatelli MC, Galanello R. Control of beta-thalassaemia by carrier screening, genetic counselling and prenatal diagnosis: The Sardinian experience. Ciba Found Symp 1996;197:137-51.